By now, most U.S. schoolchildren are either back in the classroom or headed there soon. As they make the transition from summer camp and bug spray to math homework and science projects, their weary parents may well wonder if children in the U.S. spend less time in the classroom than kids in other countries. The answer: Not really, though it’s hard to say for sure. Making comparisons between the U.S. and other countries is complicated, mainly because each U.S. state sets its own standards for minimum instructional time (more on that below), while in other countries such standards typically are set at the national level. Because of variations in the length of both the school day and the school year, the best basis for comparison is total number of instructional hours per school year. And since many states have different minimums for different grade levels, we picked three representative grades — one each for elementary, middle and high school. Among 33 mostly developed nations, annual “total intended instructional time” averaged 790 hours for primary students (ranging from 470 hours in Russia to 1,007 hours in Chile) according to data compiled by the Organization for Economic Cooperation and Development. 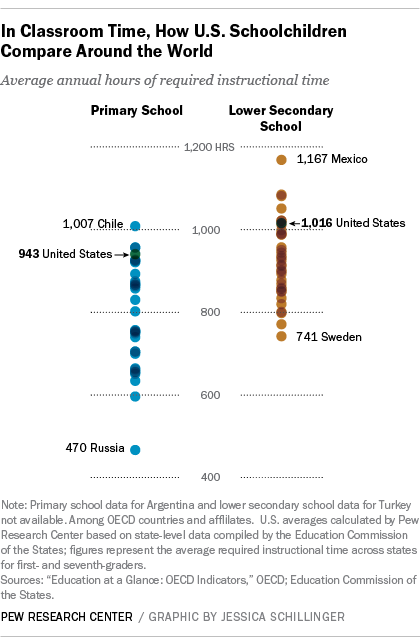 For the international equivalent of U.S. middle-schoolers, average annual required hours increased to 925 (ranging from 741 hours in Sweden to 1,167 hours in Mexico). The OECD did not have data for high schoolers. Nor did the OECD report include U.S. figures, since instructional-time rules are set by individual states. But based on our analysis, the U.S. would place near the top of both lists. Both sets of numbers, though, mask considerable variation and contain many caveats. Countries may define “instructional time” differently and set their own rules on when, and for how many years, students can attend primary and secondary school. And the OECD data don’t include time spent with tutors, in “cram schools” or in other supplemental classes, which are very common in some countries.